GoldenEye is the soundtrack to the 17th James Bond film of the same name and was composed by Éric Serra. It was released by EMI on November 14, 1995. Serra composed and performed a number of synthesizer tracks, including the radically reworked version of the James Bond Theme that plays during the gun barrel sequence, while John Altman and David Arch provided the more traditional symphonic music. 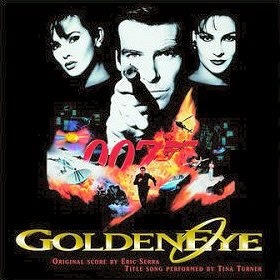 The theme song, GoldenEye, was written by Bono and The Edge of Irish rock band U2, and was performed by Tina Turner. "The GoldenEye Overture: Half of Everything Is Luck/The Other Half Is Fate/For England, James"
"We Share the Same Passions: The Trip to Cuba/The Same Passions"
"Little Surprise for You: Xenia/D.M. Mishkin"
"The Severnaya Suite: Among the Dead/Out of Hell/The Husky Tribe"
"A Pleasant Drive in St. Petersburg"
"That's What Keeps You Alone"
"Dish out of Water: A Good Squeeze/The Antenna"
"The Scale to Hell: Boris and the Lethal Pen/I Am Invincible"